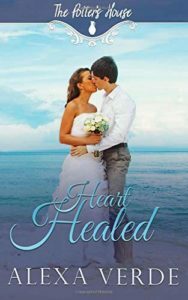 Heart Healed by Alexa Verde is a delightful contemporary Christian romance that will warm your heart and leave you smiling. It is the tenth book in The Potter’s House series but can be read as a stand-alone. Life leaves scars that are not always visible. “You’re so much more than this scar.” Our scars do not define us. They reveal where we’ve been but not where we are going. The novel has the traumatic subject of self-harm. A character believes that cutting takes away the emotional pain. It is a hard read but Alexa Verde is not afraid to write about gritty issues that affect some lives today. We, the reader, need to be sensitive to these issues and if we suspect someone needs help, to give it. If the victim is one of us, we need to find someone we trust and get help. Victims need our love and support to help them heal.